Cool. Seems like a USB gamepad might make it easier to control the arm. This is a perfect example of one of those things that is being used exactly as it was intended. An arduino and two shields controlling a premade robot arm…oh yay! I’ve never seen that before! Someone buy this guy a Logitech VX Nano mouse with the weighted free rolling scroll wheel. I generally agree with @Erik, I don’t think moving the wheel while holding down a button is very comfortable, or precise. Left-click for Z and rotate, and Right-click for gripper and wrist, I say. why not just use a track ball mouse, curves to the hand and better precision when moving and better for tight spaces. i use one every day i like it better than a regular soap bar mouse. 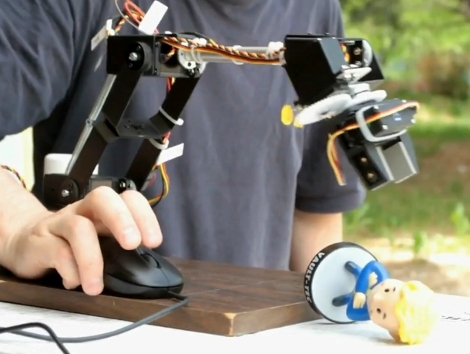 Ironically, I just put together a Manipulator arm controlled mouse. – connect the robot arm to an iPhone 4 via Bluetooth. – mount a small, outward-facing video camera onto the robotic arm, so you can see where the arm is via your Internet equipped iPhone 4, provided the video camera is wireless enabled as well. – use the iPhone 4’s gyro to move the arm around and you would be able to SEE out of the wireless camera, from your iPhone 4’s screen. – double-tap the iPhone 4’s screen and some switches appear, with enough room still available to be able to see out of the robotic arm. The switches trigger the gyro’s control to and fro the entire robotic arm, and rotating, to rotate the grabber. – with double-tapping also brings up a slider which can be used to close and open the grabber. Is this at ALL possible?!?!?! The end of the hacking community occurred pretty much as we had predicted. Too many noobs, not enough parts or datasheets to go around. The details are trivial and pointless, the reasons, as always, purely nerdy ones. @octel: I love you for that reference. Definitely need one of the Logitech mice with the freewheel on it. That alone would smooth out the jitters quite a bit. I’d love to see an update with one being used in place of the standard mouse. I can’t believe he didn’t hook the robotic arm up to the mouse to make it control itself. That would be an epic meta-moment. why not make button + mouse movement do the other jobs? Definitely possible. Put down your “iPhone 4” for a bit and get to work.